Are you looking to improve your outdoor space? Complete Lawn Service is your professional and experienced choice in local Virginia landscaping companies. We’ll give your home the visual appeal it deserves, with a beautifully and functionally designed landscape and a well-manicured lawn. You’ll come home not only to a house surrounded by beautiful greenery, but also with a greater return on its value. Studies have shown that a professionally designed landscape can increase the rate of return by as much as 15% over comparable homes! Professional Lawn Care. We cut and edge grass to varying heights depending on the time of year, recycle grass clippings, and we weed-whip spots that a mower can’t get to. 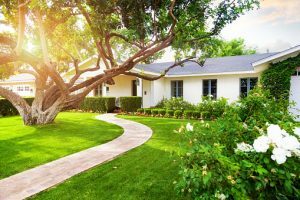 We also have lawn care programs of varying levels so you can have a thick and green lawn, and shrub and bed care that keep your bushes and plants neatly trimmed. Landscapes and Hardscapes. We strategically arrange plants and shrubs to give your outdoor space both beauty and function. Complete Lawn hardscapes improve the look and purpose of your walkways and patios, and we take the time to ensure proper drainage for healthy soil. Irrigation. Keeping your lawn watered properly means everything. That’s why we employ a Certified Irrigation Designer to design and install a sprinkler system that works with pressure and flow to irrigate your property evenly and without wasting water. Once it’s installed, we’ll maintain and repair or upgrade your system to meet your lawn’s needs. We offer additional services too, like mosquito control…we use an environmentally friendly oil spray to free your lawn from ticks and mosquitoes. And we don’t close up shop in the winter months…if you need to, we’ll use our plows to get you out from under big snowfalls and get going again. At Complete Lawn, we strive to show our customers what makes the smarter choice in local Virginia landscaping companies. Call of contact us today for a free consultation and let us help you create an exceptional outdoor space!